It’s estimated that cowboy builders cost the British public £1.5 billion annually, this is a very serious problem and is having a negative impact on peoples lives and on the property they live in. Cowboy builders come in all shapes and sizes some appear to be from legitimate companies, others will just knock at your door, and pressure you into work you do not need. With tactics ranging from charging over inflated prices for appalling work, to asking for a deposit and never starting a job. In our experience we have had to go and redo many jobs that cowboy builders have done, from the small to the large. Many jobs that we have rectified have endangered the lives of customers, in some instances we have seen buildings have been condemned by the Council. Such an example was a loft conversion that was done in under two weeks, a loft conversion can take anywhere from 6-12 weeks on average with three men, depending on the size and specification. The cowboy builders had cut all the strength out of the roof and it was slowly collapsing into the house. We have also seen carports collapsed on vehicles due to them poorly been attached to the house, luckily in all instances no one was hurt. Taking the cheapest price for any job you want doing on your house is a sure sign that you will not get a quality job, in most cases the problems are found weeks, or months after the job is done this is particularly most common with work done out of easy access i.e. anything which is at guttering level or above. They will knock on your door and only have a mobile number as point of contact with no landline, this is so they can easily change numbers with pay as you go sim cards, and obviously so you do not know their address. Unmarked van or vehicle a tell tale sign probably the most important, a reputable business or company will have a sign written van only those who do not want to stand out or easily trace by annoyed customers will have an unmarked van. Though some cowboys have marked vans and change company names to avoid detection. Will want cash up front without doing any work, they may even want the full amount. They will want all payments to be paid in cash, no matter how big the amount, this is so they do not have to declare the money to the government and pay tax, nor have to pay it into any bank account. No written quotation or written contract, everything will be done verbally, that means if you ever have to go to court their is not written evidence making it difficult to prosecute in a court of law. You will have no reference to the quality of their work, such as a quality web site or locations of previous work they have done, it will just be their word. If they do give you locations about previous work they have done do your homework, knock on the door of that house and check that the work was carried out by the same builder; it is common for cowboy builders to pretend that they carried out work which has actually been done by others, this is usually on larger projects such as extensions. The problem is a real one and people need to be well educated to save themselves stress and money, a proper job will always cost more money, three quotes for a job and the cheapest one does not mean that those three people are going to carry the job out the same way. In our Blog I will be discusses some of the problems we see with poor workmanship and hopefully help educate you on how jobs should and should not be done. Build a new flat roof the right way ! Many people in England have felt flat roofs, for the simple reason that felt is a product that lasts a long time and it is still one of the most cost effective ways to protect your flat roof. 20-30 years ago chipboard was used often by large developers instead of structural plywood for cost reasons. This should never have been used for the very simple reason, once it is wet, it looses its strength. This can lead to sink holes in your roof under your felt, making your roof not water tight and dangerous to walk on and inspect. Many flat roofs we see have not been touched for 20 years or more and are in need of full replacement or have been covered over with aluminium paint or liquid tar by a cowboy builder who has charged the customer for a new felt roof, when that has not been the case. If your roof structure ie plywood or chipboard has lost its strength do not cover your roof with with aluminium paint (solar paint), liquid tar or another layer of felt. This will not change the fact that your roof is structural compromised and needs a completely renewing. Covering the problem will not make your roof watertight in the long run, and will eventually lead to a either a roof failure, or a major water leak. Replace your flat roof completely, if the roof is structurally compromised. This means stripping everything off back to the roof trusses to inspect the strength and condition of the existing roof structure. We added 4 inches of gradient to made the water run away from the house by adding wood firrings to existing structure. Most Important: Make sure you have a good gradient on your roof 4 inches which runs away from the house. A good gradient means that water moves quickly off your roof and ensures you will never have standing water. This creates the best conditions to extend the life of your flat roof. Standing water is bad for your felt as it causes damage to it when it freezes. Cowboy roofers will not add gradient or extra strength, this because it is time consuming and it means much more work for them. Add insulation to your roof whilst it is uncovered. This is important to make your house more efficient as 25% of your heat is lost through your roof. 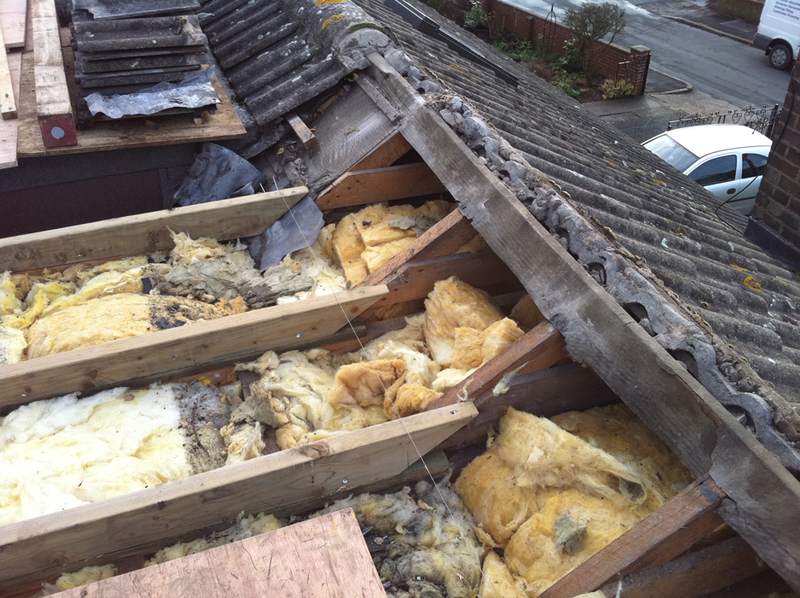 Your existing insulation will not be up to present day standards as building regulations have improved since your flat roof was last insulated, it may not even have any at all. Again make sure this step is done correctly, if you can go up and inspect the work yourself, or ask to see photographs of the work. We have often found that this step will either be missed completely or done to a poor standard. Make sure the roof is covered with thick structural plywood, and is screwed down securely, this will help strengthen the existing roof structure and ensure a long life for your flat roof. This material is designed for exterior purposes. Make sure thin plywood or chipboard is not used. What you want is a thick premium quality black underlay of rolled felt, and a thick premium quality mineral felt over the top, with a 4 inch overlap on each joint. Make sure you see samples, cheap underlay is very thin and tears like paper, a premium product is 2-3 times thicker and much stronger; it feels rubbery and will have a sheen. Rolled mineral felt has replaced the gravel which used to be placed on top of plain tar roofs, mineral felt is a far superior finish to solar paint, aluminium paint or gravel and will outlast them all. If your have a roof with a good gradient, with all the specifications mentioned above your flat roof should last 20-25 years or even longer. Ask for samples and get in writing which felt product your builder will be using, and make sure that this matches the sample you have been shown. Ask to see the felt before it goes on your roof when it arrives on site. We have found that in some cases customer have been shown a premium product and then on their roof a very thin underlay has been used which is then painted over with aluminium paint (dubbed as Solar Paint), this is a very poor way to do a flat roof we would not recommend using this method. This method is done because it is very cheap and very quick for the person doing it, and most likely you will be charged for a new premium flat roof, which it is not. Make sure that your roof is not done like this unless you have asked and agreed upon these specifications.